Using SQL Server Views with Access: Index needed for editing data. 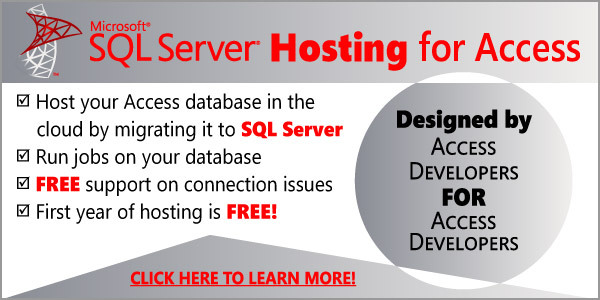 SQL Server views are one of the best tools a Microsoft Access programmer can use to limit exposure to data and improve Access performance. ix_name: The name you assign to your primary index. view_name: The name of your view in Access. fields: One or more fields seperated by commas that will compose your primary key. That’s all there is to it. We hope you can “Discover the Power of Your Data!” with this tip. strSQL = "Create Index " &amp; strIndexName &amp; " On " &amp; strViewName &amp; "(" &amp; strFields &amp; ")"
8 years later and this post just saved someone’s life. Thanks for posting this! Is it possible to make the result from a pass-through query editable (edit, new, delete) from within Access i.e. in the same way as I can edit linked tables? No answers but I now understand that pass-through queries are read-only. Another question: How do I “populate” a @variable in a pass-through query from an Access Form or a VBA variable? Where should I place the code? In the actual pass-through query or a separate query or in VBA? The line would go into your code. Thanks a lot! It works fine. It seems that querying a SQL server view is faster than querying the table? I am new to SQL Server, is there an advantage to index the view in SQL Server? Usually there is no benefit, only if you intend to edit the data in Access.